I've never cooked anything for Thanksgiving, with possibly the exception of an appetizer. Nothing for the main course, though. To me the mashed potatoes (and gravy) are the best part of the meal. I don't want to screw them up. This year we'll be with my in-laws. 'Nuff said. Anyways, for the last month I've been pinning all sorts of recipes for mashed potatoes. Crock pot and otherwise. None were really jumping out to me, so I decided to go ahead and combine elements from some of the best sounding recipes I'd pinned. The result was awesome!! 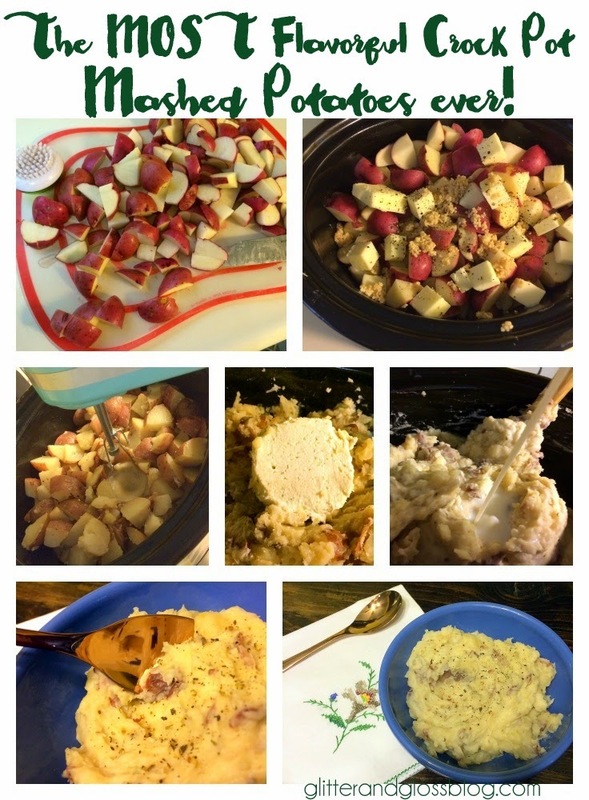 Without further adieu - the most flavorful crock pot mashed potatoes ever! Step one. Clean, peel and chop your potatoes. This is for sure the most time-consuming part of this dish. (I will outsource this to Tony on Thanksgiving!) As you can see my potatoes are chopped roughly. You'll blend them up later, so no worries. Step two. 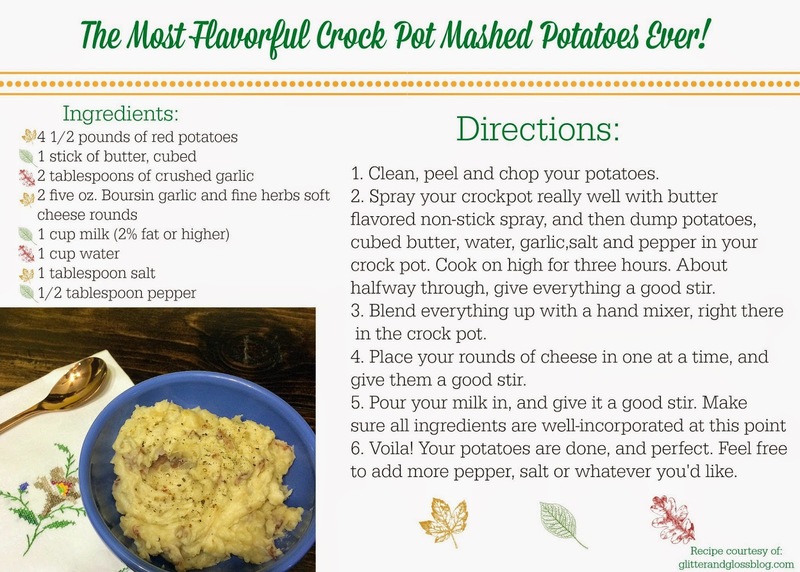 Spray your crockpot really well with butter flavored non-stick spray, and then dump potatoes, cubed butter, water, garlic,salt and pepper in your crockpot. Cook on high for three hours. About halfway through, give everything a good stir. This is what everything will look like after three hours of cooking. Step three. Blend everything up with a hand mixer, right there in the crock pot. I didn't go overboard, because I don't love my mashed potatoes super duper creamy. I left some good texture in there, but feel free to blend as much or as little as you want. (Here's what boursin cheese looks like, if you're not familiar. (I recently got this three-pack at Costco) You could also use herb goat cheese (yum! ), or rondele soft cheese in place of it. Just make sure you have about ten ounces of whatever soft cheese you're choosing to work with. Step four. Place your rounds of cheese in one at a time, and give them a good stir. Step five. Pour your milk in, and give it a good stir. Make sure all ingredients are well-incorporated at this point, if you prefer very creamy potatoes, you might even want to go back in with your hand mixer. Continue to cook on high an additional 30 minutes. Voila! Your potatoes are done, and perfect. Feel free to add more pepper, salt or whatever you'd like. These potatoes are perfect for Thanksgiving because they make enough to feed a crowd, and with the addition of all that cheese and butter, they're a bit more decadent than the kind of mashed potatoes you might serve as a side dish with a random meal. It's also great making them in the crock pot, because you can keep them warm for hours, just by changing the setting to "warm" and putting what you want out immediately in a serving bowl. Crock pots are also super portable, and easy to take with you. Please go ahead and PIN this recipe, and let me know what you think!